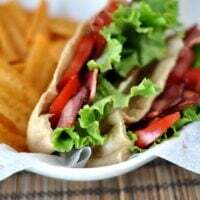 Dinner hath not known such delicious simplicity as the BLT Pita Pocket meal. 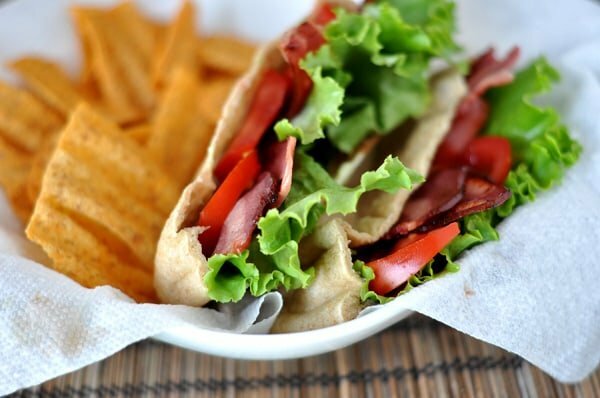 And a healthful, hearty little meal it is – whole wheat pita pockets are filled to brimming with crisp turkey bacon, fresh lettuce, bright, juicy tomatoes, and a creamy, light avocado/mayo spread. I ventured out and made my own pita pockets and wish I could share that recipe but since only about three of the 12 baked up with an actual pocket (the others resembled a lumpy flatbread…delicious, but not a pita pocket), it looks like I need to perfect them a bit more before sharing. Feel free to use your own favorite homemade recipe or grab a package at the store (from what I hear, all pita pocket brands are not created equal so try to grab fresher-tasting pitas, if you can). With fall baseball starting a couple nights a week and trying to cram every last bit of fun into the week before school starts, quick meals like this are just plain awesome. Cook the bacon on a griddle or skillet over medium-high heat until crisp, setting aside to drain on a paper-towel lined plate. In a small bowl, combine the mayonnaise, avocado and vinegar. Season with salt and pepper. Slice the tomatoes thinly. Cut pita breads in half and open the pockets. Spoon a dollop of the avocado mixture into the pocket and fill each pita with bacon, lettuce, and tomatoes – dividing all ingredients evenly between the pita breads. The mayo/avocado mixture becomes quite soupy after sitting for longer than 5-10 minutes, so I suggest mixing that up right before serving so it stays thick and chunky. Also, if your pita pockets are on the small side, you may need to cut the tomatoes and bacon in half to fit everything inside. Next Post » School Lunch Solutions! Oh Yum! That is such a great idea and keeps the ingredients way better together. Might have to turn our favorite B.L.A.T.E. (Bacon, Lettuce, Avocado, Tomato, (poached) Egg) into a pita version! Thanks so much for responding. I’ll give it another try, and see if we can come up with crispy turkey bacon. I love your blog – the recipes are fabulous & the photography is top notch! Thanks for all you do! Have you ever thought of writing a cookbook or going on TV with all your recipes! You really should! 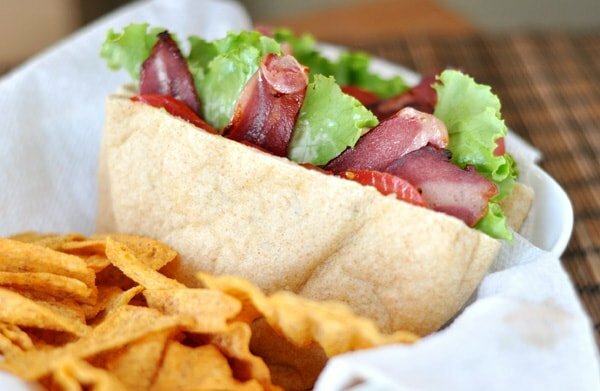 Great twist on the classic BLT! So I cannot resist commenting on your photos again! They are perfect, beautiful and so full of color – they make me want to try every recipe! What a wonderful recipe! This will definitely be great for lunch. Do you have any tips for making decent turkey bacon? Brands, cooking tips, anything??? I made it for the first time last weekend, and it was an epic fail for the entire family. Thanks in advance! Lori – I usually buy the Jennie-O brand of turkey bacon and I cook it on my griddle (a large griddle I make pancakes and french toast on). I know a lot of people have good success using the oven, but I don’t like to turn my oven on when I don’t have to in the summer. I’m sorry your turkey bacon experience was such a failure! I’ve found that it can burn and scorch much easier than traditional bacon so I cook it at a lower temperature and flip earlier so it doesn’t leave a weird gummy, scorched residue on the griddle. Good luck! Love this! Some nights you need something quick and easy like this. Gorgeous photos! I can’t get your school lunch solutions link to work. Whenever I click on in from google reader it gives me a 404 error. I hope it is easy to fix. I am super excited to read that post! These pita’s look great by the way! Any tips on how to not have your pita bread fall apart? Maybe a great brand? BLT’s are one of my favorite sandwiches! I love the pita and avocado spread…I bet this is delicious!